1873 - showing the post office in Iowa County. See "dots" just above the "D" in "Mounds"
Ebenezer Brigham was postmaster when a post office opened in Iowa County as Moundville Post Office in 1831. With John C. Kellogg as postmaster the name changed to Beaumont in 1839. In 1843 the name became Blue Mound (no "s") Post Office when it moved to Dane County to Ebenezer Brigham's farm house in section 5. The post office/trading post/hotel and residence was also known as "Brigham's Place". In 1857 it moved back to Iowa County where it soon was renamed as the West Blue Mound (no "s") Post Office by its postmaster Cornelius B. Arnold. West Blue Mound Post Office moved back to Dane County in April of 1863 (Edward Dale postmaster) and then back again to Iowa Co. in December of that year (John Helmenstine postmaster). It finally moved back to Dane County as Blue Mounds Post Office in 1881 with William H. Jones postmaster in section 6. 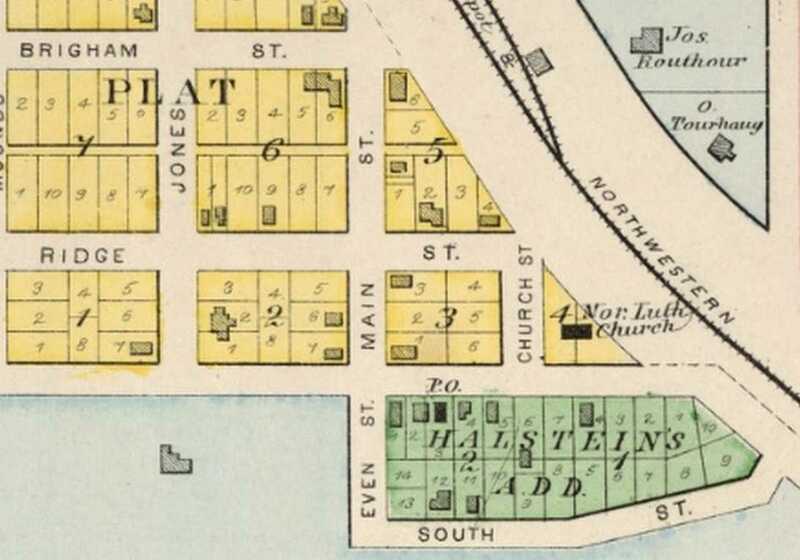 In the Legislative Manual Wisconsin 1868 and on the 1873 plat map above, a West Blue Mounds Post Office was in Iowa County. 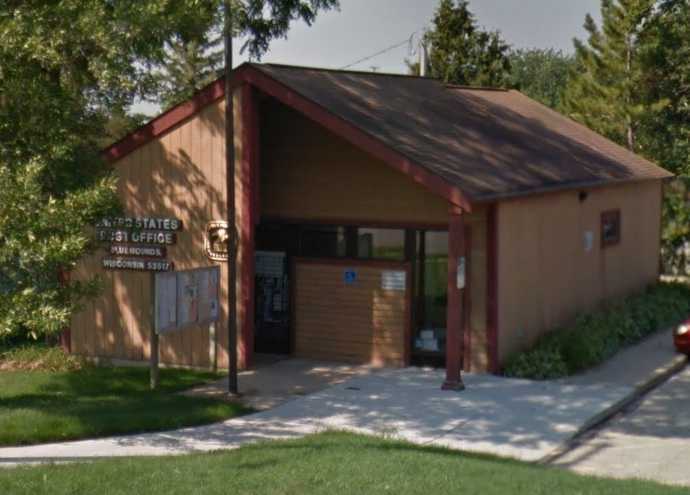 By 1890 the name West Blue Mounds Post Office and "East Blue Mounds Post Office" were no longer used and a Blue Mounds Post Office was established in the settlement. (see map below). In the 1877 Madison, Dane County and surrounding towns published by Wm. J. Park & Co., Blue Mounds had a post office as early as 1828. He goes on to say the there was never an East Blue Mounds Post Office. It was just called Blue Mounds Post Office. He also says that West Blue Mounds Post Office was in Iowa County. The Wisconsin Blue Book lists Blue Mound (no "s") in 1853-1862 in Dane County, Blue Mounds in 1863-1866 and again in 1883 to the present. West Blue Mounds is in Dane County in 1859-1862 (coinciding with Blue Mound which is east of the village at the corner of the Old Hwy 18/151 and Hwy 78 S at the corner of section 10, 11 and 14,15 and noted as "East Blue Mounds" on the plat maps) then in Iowa County from 1863-1882. Both Blue Mounds and West Blue Mounds both were noted from 1863 to 1866 and again from 1870 to 1875. See chart below. At some point after 1882 the post office was located at 10995 Division Street (see first 2 images below). Blue Mounds incorporated into a village in 1912. In 1932 a red brick bank (see last 2 images below) was build in "downtown" at 10985 Division Street. The bank failed shortly thereafter and the building was used for other purposes. 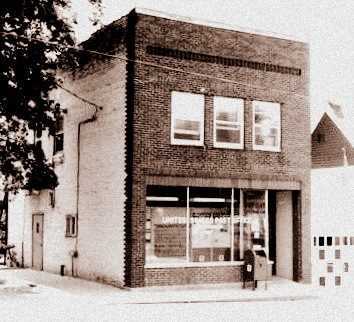 In the 1950's the Blue Mounds Post Office moved into the red brick building. 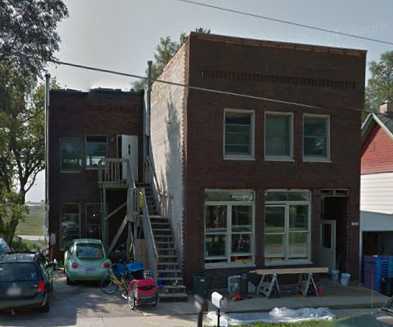 In 1992 it moved to its present location at 2965 Jones Street. In 2015 it is one of the smallest post offices in the area. Dec. 9, 2014 the brick building on Division Street was destroyed by fire. 1890. Post Office is third building (black) from the left at the top edge of the green area. "1890" building at 10995 Division Street.